I'm not going to lie to you, fitting in fitness and healthy eat does take time. Add in a full time job, kids, and kid activities and time is short. But you do not have to sacrifice fitness and healthy eating. It just takes a little bit of planning and flexibility. I spend a few moments Sunday morning planning out the week's meals, make a quick shopping list, and write the weekly menu on a little dry erase board I have in the kitchen. I'm also lucky because my kids love eggs. We have plenty of them because we raise chickens, so if time is short, we have breakfast for dinner. Healthy and quick! My meal prepping doesn't end with family meals. I prep out my lunches for the week as well. Most of the time it's a large batch of something and I divide it into 5 smaller containers that I can just grab and go in the morning. This week it's Roasted Squash Soup. 1. Drizzle squash with oil and sprinkle with sea salt and roast at 400F for about 40 minutes. Be careful to not taste, because you may find yourself sitting with the pan and just eating the entire contents; therefore, having to start all over again. I may have done that before. 2. Brown sausage. I've chosen locally raised maple flavored sausage. But you choose whatever you want! 3. Dice up the onions, celery, carrots and add to the sausage to caramelize the onions and soften the celery and carrots. 4. When the sausage and veggies are complete, add to chicken stock (hopefully in a large stock pot) and warm up. When squash is complete, add to the stock as well. Heat thoroughly. Serve. *You could take the squash and add some stock, put it in a blender to make the squash smooth and creamy or just do what I did above and eat the soup with texture. I've done both and enjoy both. This is super easy and great to eat at lunch! Last week my lunch meal was UnStuffed Cabbage. Since my kids are not fans, I made it all for myself and loved it! 1. Brown the beef, add in diced onion. 2. After the beef is browned, add in the tomatoes and cabbage. Stir often. 3. When cabbage is wilted and softer, it's done. Fitting in fitness is the same. I schedule it. But I do not get upset with myself if it doesn't go as plans. Trust me. It's taken me a long time to learn this skill! 1. Schedule it. On a calendar for everyone to see, in your planner or on your phone. Whatever works! 2. Track your workouts. After you complete it, record it. In a planner, on the calendar, through an app or on a website devoted to tracking workouts. I use DailyMile and play with Strava a bit. I like to see the numbers increase with time. That's huge motivation! 3. Take time for yourself. It's well deserved. Sometimes it's hard to get this to happen though. My husband works in retail, so as the holidays get closer, his work hours get worse. Fortunately, I usually have a few days a week I can squeeze in a run before my son and nephew get home from school. I teach at the local high school and they are both in elementary. If I don't have any meetings or have a short one, I can get in 3-5 miles. 4. Bring the kids along. Now, if it's snowing or pouring, this isn't really a great idea. But if it isn't - they just might love coming along! Sometimes my 10 year old will run or ride his bike with me while I push my 4 year old in the jogger. 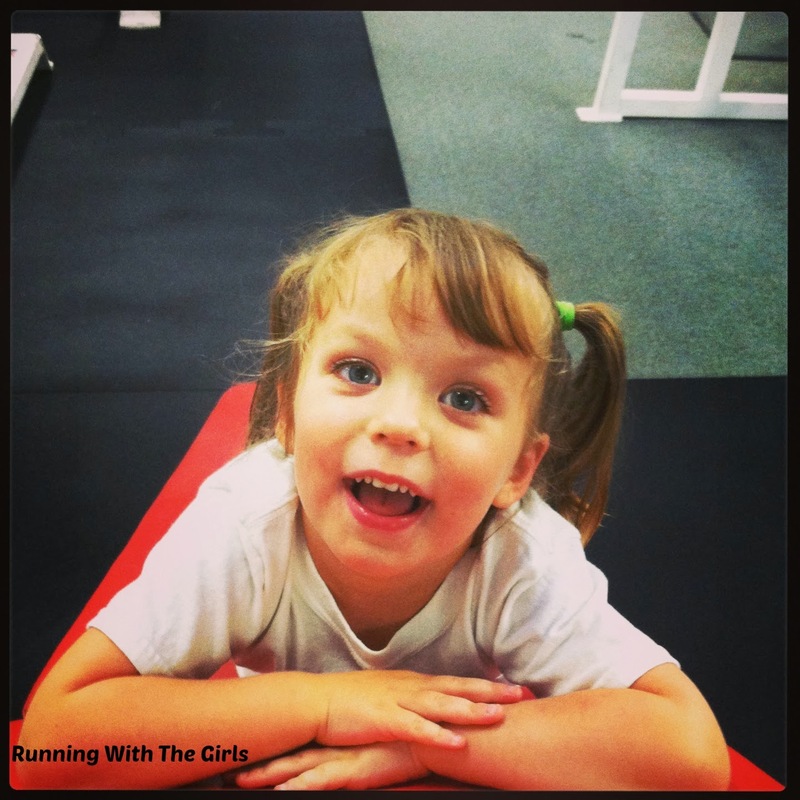 The 4 year old does run with me at times too! I've also been known to bring the kids to my gym with me. 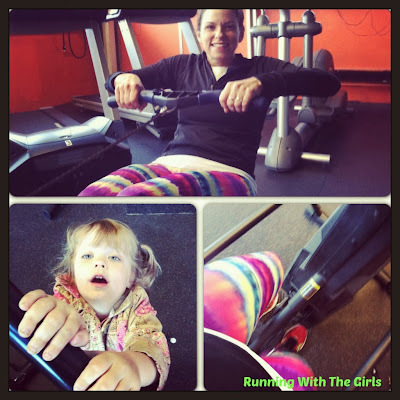 Sadly my gym does not have child care, but the folks there are incredible (I also work there part time) and allow me to bring them just as long as my kids are not running around or getting on the equipment. A little bribing and electronic devices go along way with my kids. Do what you need to do!!! 5. Ask for help or get a sitter. It's worth it. Instead of getting mad at my husband for working or training for yet another marathon, I've decided that I need to be more proactive, so I found a fabulous sitter. It's taken me a very long time to let go and do this. If she's not available, my in-laws might be or my sister-in-law or brother-in-law might be as well. 6. Be flexible. If you had it scheduled to do 8 miles on a Wednesday, but only had time to do 3. It's okay!!! Maybe you can fit in a yoga DVD later on or maybe you can find a local yoga or fitness class to get to using SpaFinder. What's even better is that SpaFinder has some awesome coupon codes too. So you can save money on classes too! 7. Get creative. Every Wednesday Izzy has dance for an hour. So, I take that time and run. Sometimes I run by myself or I bring Tucker along. The same goes for Tucker's soccer practices. I drop him off and head out with Izzy and run. I don't mind missing practices, just as long as I'm there for the games! Enter below through the Rafflecopter! Special thanks to Coupons.com for sponsoring this post and giveaway! I agree with all theses, even do a few myself like food planning (if I don't I can go crazy in the kitchen). Learning to let go of a schedule has developed for me over the last few months with injury, I have a schedule but if I can't make a session or swap days for a rest day when I need it or life gets crazy, I can now let it go easier than I used to ... it really makes life less complicated and exercising more enjoyable. Awesome tips! I roasted squash last night. Perhaps that soup is in my near future! I need to be SO much better about meal planning! I definitely schedule it and also have contingent plans! It's kind of a constant battle, isn't it? Sometimes it is hard to find the mental energy to do all that planning. 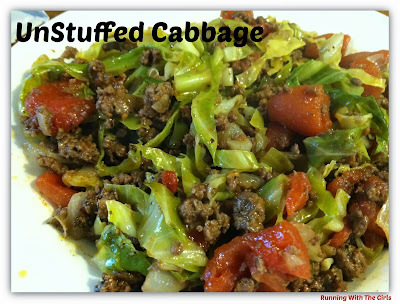 And I think I'd like your Unstuffed Cabbage recipe - might add that to my "to try" list. That Unstuffed Cabbage looks terrific. I'm pinning that to try later. It would definitely be just for me because I know my kids, they hate to eat cabbage. Still great...more for me. I work out at least 5 times a week and I know how difficult it is to fit that in and eat healthy. I work on this constantly. My kids hate cabbage too. I think I did as a kid. And I agree. More for you!!! Sometimes I do just give in and order pizza. We all have tired days!!! YOu are the the pro at crazy creative! I love roasting squash. For soup, snacking, whatever! I think injuries push us to be more relaxed. A necessity!! !